rms the company says. No word on official Android or Palm WebOS apps yet. Twitter bought the hugely popular iPhone client Tweetie and will rebrand and relaunch it as a free official application. To be called Twitter for iPhone, the app is expected in the coming weeks, with an iPad version following soon after. Though unmentioned in the announcement, Tweetie could become the official Mac OSX desktop client for Twitter as well. Tweetie, from Atebits developer Loren Brichter, is a $2.99 iPhone app, which in a few weeks will be rebranded as the official free Twitter client for the iPhone. Brichter, who won the 2009 Apple Design Award, will join the Twitter team to create an iPad version of Tweetie as well. l app for the platform. 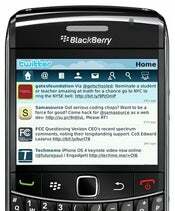 The official BlackBerry app, free to download from BlackBerry.com/Twitter, features real-time BlackBerry push of direct messages, @replies notifications and browser integration for tweeting links. opics, and customizable interface fonts and tool bars. A cool feature is the inbox integration that lets you read Twitter direct messages alongside your email and text messages. It will be interesting to see how users respond to free official Twitter apps, considering that at least for the iPhone there are several other free and paid clients, which are not as popular or well designed as Tweetie. Applications developers at least, can't be very happy about Twitter's move into the software arena.